BeHi Bonsai 盆栽: Plant Amnesty can kiss my Bonsai! Okay, it's one thing if you don't like Beacon Hill's funky shrubbery, but its a whole different issue when you refer to it as being 'goofy' as Cass Turnbull seems to have done in today's Seattle Times article on Plant Amnesty. I can certainly appreciate wanting to protect plants from senseless mutilation but Plant Amnesty seems to have nominated themselves the arbiters of taste with comments like "When the inherent beauty of a plant is compromised, it's painful for those of us who know what it should look like,"
Who gave Plant Amnesty the authority to decided what plants should look like? They have a Shear Madness photo section on their blog and I actually think that some of the photos are amazing and I find their comments to be culturally insensitive. That's why we are introducing a new T-Shirt! 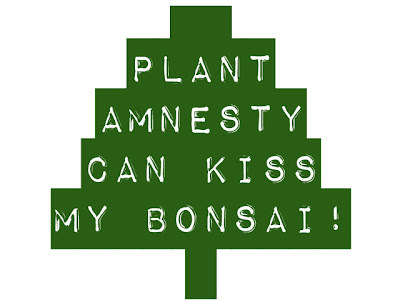 Let Plant Amnesty know what you think of their mission and show your Beacon Hill pride at the same time! All proceeds go towards Beacon Arts celebrating creativity in all its forms on Beacon Hill. You probably know that the shrubs you're referring to aren't bonsai. The term you want is Ueki no Te Ire. hi anonymous, thank you for the correction. 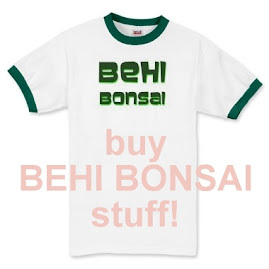 But who is going to go to a website called 'Behi Ueki no Te Ire?' actually if you look through the meta data on the website you will see that I often use Ueki no Te Ire as a tag, however Ueki no Te Ire is a traditional JAPANESE giant topiary form and I don't think that it really covers everything that is happening on Beacon Hill. I should probably do a longer post on this but I mostly use Bonsai because people recognize it, as opposed to Penjing etc. why they are not bonsai?